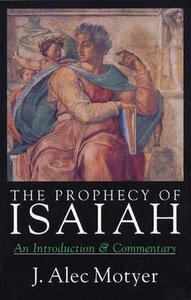 About "The Prophecy of Isaiah"
J. Alec Motyer (M.A., B.D., D.D.) was formerly principal of Trinity College in Bristol, England. He has extensive experience in parish ministry and is well known as a Bible expositor. He is author of The Prophecy of Isaiah, and he is Old Testament editor of IVP's commentary series, The Bible Speaks Today. He has written several volumes in that series including Exodus, Amos, James and Philippians, along with the Tyndale Old Testament Commentary on The Book of Isaiah. Most recently he has published Journey: Psalms for pilgrim people and Treasures of the King: Psalms from the life of David.